A136 Industrial V-Belt. 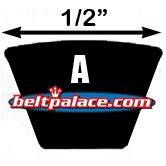 Bando/Gates Classic A-136 Belt. 138" Length (3505mm), 1/2" Wide (13mm). Home > Heavy Duty V Belts > V-Belts. A, B, and C Sections. Standard and Kelvar Construction > A-Section (Classcial) V-belts. 1/2" Wide > A136 Industrial V-Belt. Classical A-136 Belt. A136 Industrial V-Belt. Classical A-136 Belt. 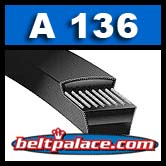 BANDO A136 Industrial V-Belt. Classical A-136 Belt. 138" Length (3505mm), 1/2" Wide (13mm). GATES A-136 V-Belt, Gates Product ID 90022136.